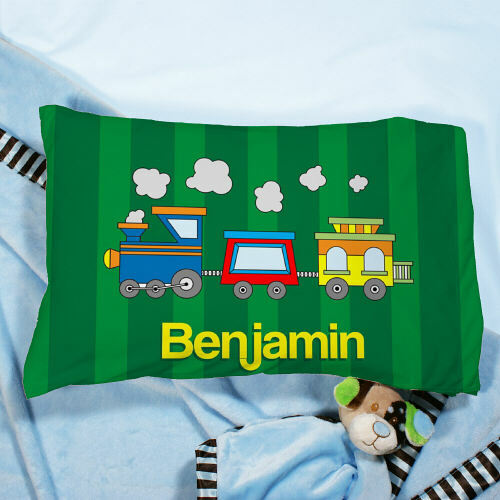 Personalized My Choo Choo Train Pillow. The pillow is so cute.. The kids can have fun, have sleepovers, trips to Grandma’s or auntie and naptime. When time for daycare your young child will be so restful when your little girl lays her sleepy head on her own Pillow. Your Young child will have beautiful sweet dreams. Youth Pillow is a 100% Polyester White Pillowcase and measures 12” x 18”. Pillowcase comes with our standard Travel/Youth size pillow and is machine washable. Personalize your Youth with any name, up to 16 letters. (ie. Addison or Timmy) Please Note: Pillowcase is made with the design on one side and is white on the back.